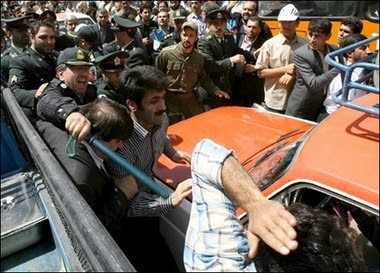 Violent Clashes at Iranian Labor Protests! Witnesses told AFP that they hoisted a coffin symbolising their demands which the police then tried to break. Hundreds of labor protesters clashed with regime thugs today at a protest in Tehran. The workers converged on a stadium in central Tehran in the officially sanctioned demonstration to mark May Day but were dispersed by anti-riot police when the march moved out into the street, witnesses said. 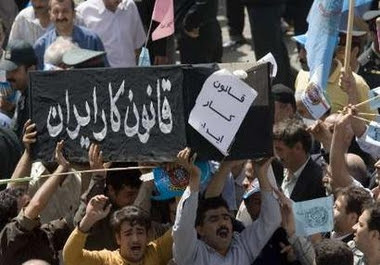 “Some 600 workers demonstrated at the exit to the stadium and shouted slogans against the minister of labour,” Mohammad Jahromi, the semi-official labour news agency Ilna reported. “Incapable minister. Resign!”, “Government, parliament, stop your slogans and act,” and “Death to the oppressors”, the protestors shouted, according to the agency. Scuffles followed when anti-riot police dispersed the demonstration as people moved into the street outside the stadium, just south of Haft-e Tir Square, a major Tehran traffic nexus. One in Seven in Iran live below the poverty level according to new government stats. Serendip reports on the miserable economic situation.